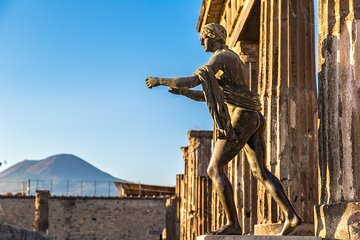 Enjoy the incredible UNESCO-listed archaeological site of Pompeii on a small-group tour. Experience the remains of this ancient city, destroy by the eruption of Mt Vesuvius in 79 AD. See the House of the Gladiators and the suburban baths and gain insight into what local life was like nearly 2,000 years ago, through such things as temple ruins, graffiti-covered walls and various mosaics. Walk in the steps of history as you learn Pompeii's fascinating story from an expert and knowledgable guide. Maria was early to meet us and talked knowledgeably and exuberantly about Pompeii for two and a half hours. The small group was an excellent idea and the small group was only 2 people - us, as it was a Saturday in the high season and Pompeii was exceptionally crowded. She was very considerate too, it was incredibly hot we were warned - and she did check that we had water and hats, but every opportunity to stand in the shade she gave us. She also answered any questions knowledgably. Francesca was knowledgeable, friendly and gave us fantastic tour with a digestible account of what we were seeing. Definitely worth the trip from Rome! Tour was amazing!! Franchescka did an awesome job!! Amazing tour guide. She was the best!!! This tour was great!!! Our guide was very knowledgable and very friendly. We had a great time. I would suggest this tour to anyone going to pompeii, it's just long enough to get you a lot of information without being too long where you start to lose interest. And I think going to pompeii without a tour would be a mistake.